"Ever see a muscle machine so addicting that it kept a 52-year-old woman tugging for five hours without a break?" I admitted that I had not, so my guide, a 52-year-old fitness-club owner, took my arm. But she did not lead me to the industry show in the tennis pavilion where all the latest in exercise technology was on display. Instead we turned left toward the hotel lobby. "There they are!" She pointed to the packed corridor of jealously tended slot machines. "The onearmed latissimus-dorsi-building bandits. And if you play three at once, it's aerobic. " I was not yet impressed. I had come to Las Vegas for the International Racquet Sports Association convention. Many racquet clubs have fallen on hard times, so their owners convened earlier this year both to commiserate and to decide in which direction the sweat of fitness is now flowing. As one racquet-club owner complained, "We now face the same problems bowling alleys faced 20 years ago. The boom is over, and we have to find other ways to draw people to use our facilities." testimonials on the rejuvenating power of a line of Nautilus machines. "I believe that if Jesus Christ came back today he would work out with weights," professed Red Lerille, Mr. America of 1960 and owner of a fitness center in Louisiana. And the other owners, as well as the equipment manufacturers, all seemed to agree. "We should take a lesson from the bowling alleys," she continued. "My weight machines cost as much as an Atari computer game, but if I had to pay for them by waiting for people to drop quarters into a slot, I would wait a long time. You know, 20 billion quarters were dropped into video games last year for little, if any, tangible reward. 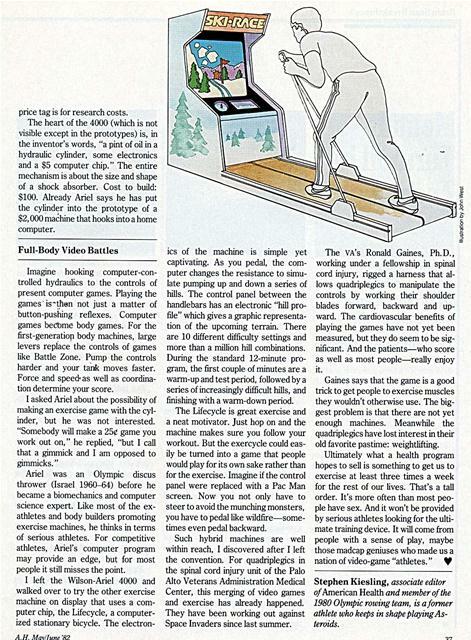 Imagine what would happen if somebody turned an exercise machine into a video game!" o than most people realize. 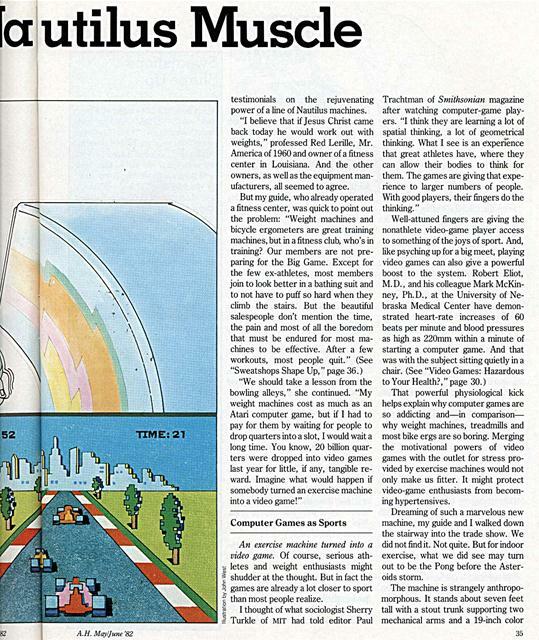 Trachtman of Smithsonian magazine after watching computer-game players. "I think they are learning a lot of spatial thinking, a lot of geometrical thinking. What I see is an experience that great athletes have, where they can allow their bodies to think for them. The games are giving that experience to larger numbers of people. With good players, their fingers do the thinking. " That powerful physiological kick helps explain why computer games are so addicting and-in comparisonwhy weight machines, treadmills and most bike ergs are so boring. Merging the motivational powers of video games with the outlet for stress provided by exercise machines would not only make us fitter. It might protect video-game enthusiasts from becoming hypertensives. Dreaming of such a marvelous new machine, my guide and I walked down the stairway into the trade show. We did not find it. Not quite. But for indoor exercise, what we did see may turn out to be the Pong before the Asteroids storm. television monitor which stares down from the top. Admittedly, the beast is not yet a game. Wilson Sporting Goods is introducing it as the ultimate training device. the screen. 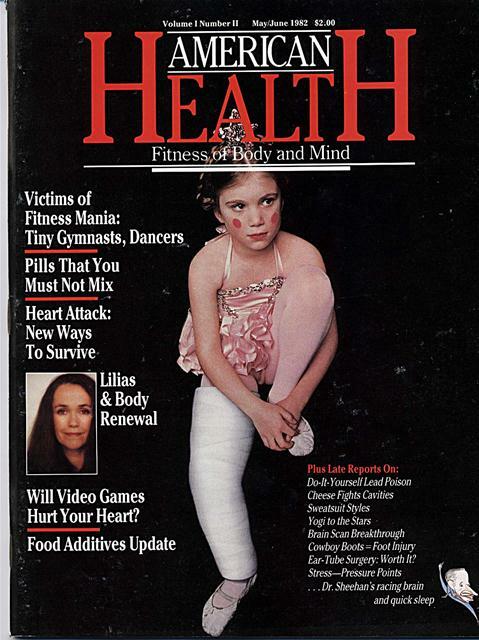 A young gymnast in a white leotard positioned herself between the machine's arms while Gideon Ariel, Ph.D., the biomechanics and computer science expert who invented the 4000, punched directions into a small keyboard. A moment later the display changed to diagrams and instructions for her first exercise, the military press. The gymnast had already been through the brief diagnostic program to acquaint the computer with her body. When shetmoved the bar to the proper height, the computer beeped its approval. This summer, when the 4000 becomes available in health clubs, each user will simply insert a special exercise cassette into a reader to program each of the exercise stations for his particular body and exercise regimen. Then the machine becomes a coach, telling you what exercises you will do in what order, and how much rest time you will spend between exercises. While trying to cheer you on with beeps, it also determines how much resistance you will push against, the speed at which you will push and the amount, if any, that the resistance will change through your range of motion. mum of 110 and a minimum of 32. " She lifted the bar over her head again and again. Each time a new bar graph sprung up beside the last one, until the computer beeped for her to stop. Then a new graph filled the screenshowing in bright red and green a curve of the total work she had done for the set, superimposed on the optimum curve that she should be working toward. Ariel pushed another button and a nearby printer spewed out a paper copy of each graph for her files. Ariel's machine had just been warming up on those presses. "We'll put her force curve on the screen again to see where in her range of motion she is weakest. We want to build where her force dropped." Ariel punched a few more buttons. "Now the computer knows where she is weak, and when she tries again, the computer will stop the bar for one second to overemphasize that point. It's called stickingpoint training. " Sure enough, the next time she pressed the bar it stuck for a second midway through the lift and then continued. Ariel put her new force curve on the screen to demonstrate the extra work put on her weak point. "You see," continued Ariel, "with my machine you can work the muscles any way you want. We still need to do more research to find out which is the best way to train, but whatever it is, this machine will do it. Other weight machine manufacturers claim that their way is the best way to train. Well, my machine will do any way. Just tell me which is best." The 1979 Federal Trade Commission report on health clubs might well have been called "Health Clubs as Consumer Sweatshops." According to the report, would-be exercisers were inveigled into signing contracts with promises and prices that might as well have been written in disappearing ink. "We had over 500 complaints a year," says Mark E. Smith, assistant attorney general for the state of Wisconsin, who testified at the FTC hearings. But Smith quickly adds, "We hardly have any complaints now." Why? New laws in 11 states require that all services be written into the contract, and customers have a threeday cooling-off period to reconsider. But clubs also have found that they don't need hard-sell tactics. The selling is done well before customers pass through their doors. One center's sales rep calls it "the Rocky syndrome." Victims cart themselves off to theaters, emerge high on Chariots of Fire and race to join a fitness center where $400 seems a small price to pay to wrestle with Nautilus machines, pound the treadmill. and relax in a well-earned sauna. The flow of new members-up to 10 a day at a branch of one New York City chain-is the backbone of urban fitness centers. Unfortunately for customers, the Rocky syndrome is not chronic. According to Harry Snyder, president of Consumers Union, the act of paying the fees cures the symptoms. After three or four workouts, 70% quit, and their dues keep the doors open for the few who do work out and the many outside who have yet to catch fitness mania. Ironically, the added motivation of video exercise machines might not only attract new members. It could backfire by keeping the old ones coming back again and again-filling the clubs to bankruptcy. price tag is for research costs. The heart of the 4000 (which is not visible except in the prototypes) is, in the inventor's words, "a pint of oil in a hydraulic cylinder, some electronics and a $5 computer chip." The entire mechanism is about the size and shape of a shock absorber. Cost to build: $100. Already Ariel says he has put the cylinder into the prototype of a $2, 000 machine that hooks into a home computer. Imagine hooking computer-controlled hydraulics to the controls of present computer games. Playing the games' is-then not just a matter of button-pushing reflexes. Computer games become body games. For the first-generation body machines, large levers replace the controls of games like Battle Zone. Pump the controls harder and your tank moves faster. Force and speed as well as coordination determine your score. I asked Ariel about the possibility of making an exercise game with the cylinder, but he was not interested. "Somebody will make a 25ï¿½ game you work out on," he replied, "but I call that a gimmick and I am opposed to gimmicks." Ariel was an Olympic discus thrower (Israel 1960-64) before he became a biomechanics and computer science expert. Like most of the exathletes and body builders promoting exercise machines, he thinks in terms of serious athletes. For competitive athletes, Ariel's computer program may provide an edge, but for most people it still misses the point. ics of the machine is simple yet captivating. As you pedal, the computer changes the resistance to simulate pumping up and down a series of hills. The control panel between the handlebars has an electronic "hill profile" which gives a graphic representation of the upcoming terrain. There are 10 different difficulty settings and more than a million hill combinations. During the standard 12-minute program, the first couple of minutes are a warm-up and test period, followed by a series of increasingly difficult hills, and finishing with a warm-down period. The Lifecycle is great exercise and a neat motivator. Just hop on and the machine makes sure you follow your workout. But the exercycle could easily be turned into a game that people would play for its own sake rather than for the exercise. Imagine if the control panel were replaced with a Pac Man screen. Now you not only have to steer to avoid the munching monsters, you have to pedal like wildfire-sometimes even pedal backward. Such hybrid machines are well within reach, I discovered after I left the convention. For quadriplegics in the spinal cord injury unit of the Palo Alto Veterans Administration Medical Center, this merging of video games and exercise has already happened. They have been working out against Space Invaders since last summer. The VA's Ronald Gaines, Ph.D., working under a fellowship in spinal cord injury, rigged a harness that allows quadriplegics to manipulate the controls by working their shoulder blades forward, backward and upward. The cardiovascular benefits of playing the games have not yet been measured, but they do seem to be significant. And the patients-who score as well as most people-really enjoy it. Gaines says that the game is a good trick to get people to exercise muscles they wouldn't otherwise use. The biggest problem is that there are not yet enough machines. Meanwhile the quadriplegics have lost interest in their old favorite pastime: weightlifting. 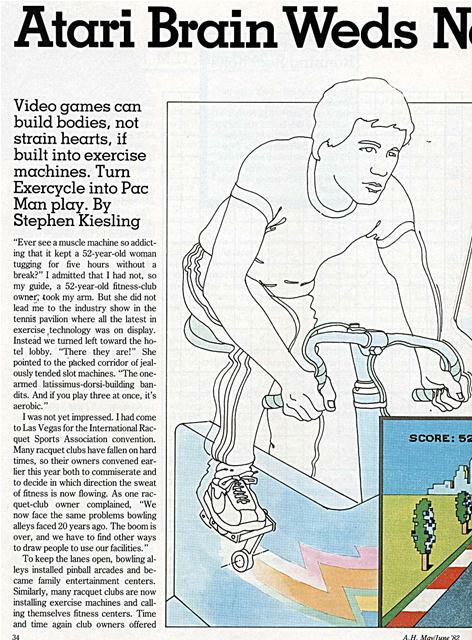 Stephen Kiesling, associate editor of American Health and member of the 1980 Olympic rowing team, is a former athlete who keeps in shape playingAsteroids. Generated on 4/22/2019 11:18:54 AM (PST) ADI/HQ/GBA/2019/ARIELCLOUD/v3.0.2018.0126.